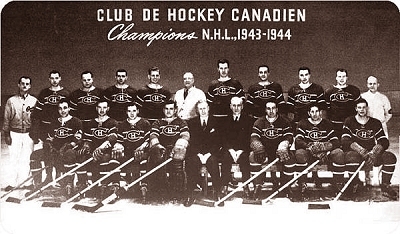 In 1944 the Canadian won its fifth Stanley Cup and this will be his third at the Montreal Forum. During the playoffs this year, Richard has five goals and five assists Toe Blake gets a win 5 to 1 against the Toronto Maple Leafs in the semifinals. And in the same series, the Canadiens set a record for the highest amount of goals scored during a game carrying the 11-0 still against the Leafs.